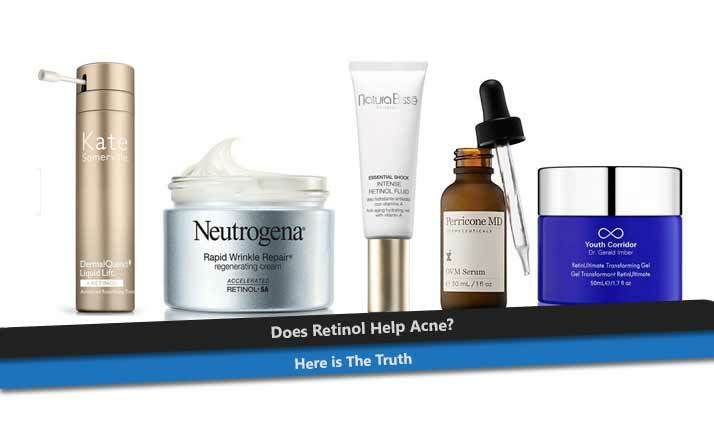 You may often hear about retinol, which is listed in anti-aging skin care ingredients. Yes, it’s because retinol is good for smoothing the wrinkles. However, you should know that it’s also a good option for treating your acne-affected skin. Retinol for acne solution even can be bought without prescription due to its gentle properties. Retinoids or over the counter retinol, is a synthetic derivative of vitamin A which the prescription version is called Retin-A. Retinol is commonly used for topical skin care treatment to reduce fine lines, fade dark spots, and target stretch marks. Furthermore, the stronger Retin-A is a more powerful alternative to treat severe acne, also wrinkles and scarring. Retinol has the keratolytic properties that dissolve dead skin layers. So, a new skin layer can come through softer and smoother. If the traditional facial scrub only brushes away the dead skin cells on the surface, retinol can work on a much deeper level. For treating acne, retinol works on altering oil production in your skin. It stops your dense sebum from clogging in the pores which commonly become a good spot for bacteria to grow which cause blemishes. When oil deposits decrease, it means bacteria can’t grow and acne won’t come out. Some studies also has shown that retinoids help to increase the production of collagen and plump fine lines which good to treat acne-affected skin. As recommended by most skin care health professionals, you should use retinol at night, not in the day time. Why? Because it can make your skin becomes more sensitive to sunbeams. During the daytime, you should use sunblock and antioxidants with an SPF rating of 15 or higher to protect your skin. If not, you will cause more damages to your skin like irritation which is in the state of high sensitiveness. You can start applying it from the evening up with nightly use. There are some after-effects from applying retinol often. You may experience drastic skin peeling and irritation, particularly those with dry skin. Don’t worry, it’s absolutely normal when your skin acclimates to the retinol. You can resolve it by using gentle face wash for cleansing and regularly using moisturizer for hydrating your skin. However, if your irritation gets severe, you should consult with your doctor. Use exfoliant product such as AHA or BHA to cleanse, tone, and exfoliate your skin in the morning. After that, gently apply your face with retinol product using a cotton swab at night. You should avoid using more than one product at the same time. After thoroughly use the retinol, apply additional skin-brightening product. Last, apply moisturizer, serum, and/or eye cream to hydrate your skin. Shortly, retinol is a good acne treatment product to be listed for your acne-care therapy. Still, for those who have dry skin, you should be more careful before applying too much. Although you can purchase it without prescription, you should better consult with your dermatologist to prevent any bad effect.